Duracell Powermat's $100 package: A charging mat, a charging case for the iPhone, and a portable charger. Just last year, Powermat and Duracell were rivals in the wireless-power world. The two brands had competing products in the wireless-charger market: Powermat's eponymous charging mat and Duracell's MyGrid charging mat. Then, late last year, the two brands formed an alliance. On Monday, the Duracell/Powermat joint venture released its first co-branded wireless charger, the Duracell Powermat 24 Hour Power System. In addition to that in-home system, Duracell Powermat is also adding wireless charging stations to a number of high-profile locations in Manhattan and Brooklyn, hoping it will help jump-start widespread adoption of its technology. After using the 24 Hour Power System for a few days, I think a combination of ubiquitous power mats and compatible charging cases has the potential to change things on a bigger scale. Although physically plugging your phone into a wall outlet to recharge it is a minor inconvenience, using a normal, wired charger seemed archaic after I started using the system. Today, I placed my phone down on a regular old table, expecting it to make a space-age beep and start recharging; I figure that's a good sign for the technology's potential. The $100 24 Hour Power package I tested includes three pieces of hardware: a transmitter mat that charges two devices at once, an iPhone 4/4S case embedded with an induction-coil receiver, and a portable backup battery that looks like the love child of a drink coaster and a hockey puck. Right now, the wireless-charging features only work with an iPhone 4 or 4S inserted into one of the special induction-charging cases. The inside of each case has an iPhone connector that jacks into the bottom of the phone, and the wireless induction system charges the device through that connection. Outside of that base package I tested, you can buy a three-device charging mat for $70 or standalone iPhone charging cases for $35. The setup is this easy: You plug the mat into a power outlet, you put the case on your phone, and you put the phone on the mat. Once the phone is on the mat, it "locks" into place with a magnet. When electrons are flowing properly, a little space-age noise blips out of the mat to let you know that the phone has started charging. The charging mat is small, sleek, and unobtrusive enough to put on your nightstand or that table by your front door where you reflexively put your keys. It also made me want to charge my phone more often than I normally do, not just because of the sheer convenience of putting my phone down to charge it and picking it up without disconnecting a cable when I needed to use it, but also because I enjoyed hearing that little space-age blip noise. The case doesn't host anything bigger than the induction coil, so it's about as thin and light as a normal iPhone case. It's also much slimmer and lower-profile than the cases in previous versions of the Powermat system. The case is made out of a durable hard plastic, with a rubber-hinged door near the top of it that lets you swing it open and slide the phone into the case. The portable backup battery included in the package is a different animal: You charge it wirelessly via the mat, but it charges other devices via built-in, wired connectors. You put the pocketable backup battery on the mat, it starts charging and storing juice, and four little indicator lights on the front of it let you know when its internal battery is at full capacity. It's essentially a power outlet that you can put in your pocket or bag, letting you recharge devices when you're in the car, on a train, in a park, or just fresh out of power outlets. The portable backup battery stores juice and lets you charge devices away from an outlet. The backup battery is also compatible with many more devices than just the iPhone. The battery comes with two charging connectors that flip out of its side: an Apple dock connector for charging the last few generations of iPhones and iPod Touches, and a micro-USB connector that supports phones and handheld devices that charge via micro-USB. The system integrates perfectly into the real world, but it's not perfect. My biggest complaint is that the included iPhone-charging case is slick in more ways than one. It has a super-glossy finish on the back of it, which can get pretty slippery. I dropped my phone a couple of times due to that friction-free case, but at least I can say for sure that the case is durable and protective enough to prevent fumble damage to the phone. You also need to pay attention to where you're laying your phone on the mat. The mat has two specific points on it that start the induction-charging process, so just placing your phone anywhere on the mat won't cut it. A couple of times, the phone only started charging once it was placed a certain way, even when I felt a magnetic "lock." In other words, waiting for that space-age blip noise isn't just entertaining, it's essential. 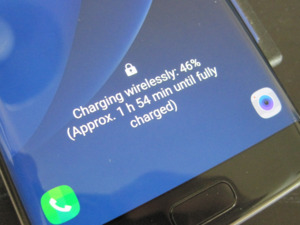 The fallacy of the term "wireless charging" is that it requires wires. Specifically, it needs the user to connect a wire from the charging mat to a power outlet. For frequent travelers, the allure of charging portable devices by just laying them on surfaces is strong. However, products like this Duracell Powermat still require power outlets and a bit of extra room in your carry-on bag. But as it turns out, Duracell Powermat is trying to fix that problem, too. The in-home charging system is a tiny piece of the pie when it comes to the joint venture's wireless-charging ambitions; it hopes to make public wireless-charging stations as ubiquitous in NYC as Chase's ATMs. "We're working on the next iteration of wireless technology, which starts with the proliferation of charging stations," said Ron Rabinowitz, CEO of Duracell Powermat. "[The mats are] embedded in landmarks such as Madison Square Garden, and we've focused on New York City first because of its 24-hour lifestyle." When Madison Square Garden reopens after offseason renovations, it will have 550 wireless charging stations embedded in its press areas, locker rooms, main concourses, and executive boxes. There will also be compatible wireless charging mats in airports (Delta Airlines' Sky Club lounges for starters) and cars (the first model will be the 2013 Chevy Volt). Rabinowitz says that public-transportation systems and stations, from trains to airplanes, are a major part of the integration roadmap. There are also Duracell Powermats embedded in side-table-like pedestals throughout Jay-Z's 40/40 Club in New York City, and charging mats are slated to be built into the Barclays Center by the time the Brooklyn Nets play their inaugural game at the arena this year. There's a reason why there seems to be a recurring Jay-Z connection with Powermat integration: the Grammy magnet/magnate is an investor in the technology and a big part of the Duracell Powermat marketing campaign. In addition to more physical locations, compatibility with a larger number of devices is another part of Duracell Powermat's big plans. Rabinowitz says a charging case for the Samsung Galaxy SIII is planned next, and wireless charging mats and cases for everything from tablets to laptops to cameras are also possible in the future. "The system can work with any [standard] connector type... USB, Micro USB, and Mini USB," said Rabinowitz. While Duracell Powermat's in-home product is compelling by itself, the technology's mainstream success hinges on that combination of any-device compatibility and widespread public integration. When charging surfaces are built into coffee-shop tables and cubicle desks, and when more devices have cases or integrated components that support wireless charging, that's when wireless charging will become truly wireless. And by the time that happens, Duracell Powermat may have a huge jump on the competition.